With its new Magellano 43, Azimut taps into the utopian cruising dream of offering speed and efficiency. It looks great but can its hybrid hull really deliver efficiency at speeds of 6-22 knots? 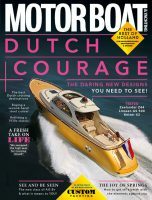 Watch the video of the Azimut Magellano 43, or for the full test see the April 2013 issue of Motor Boats Monthly.